Potato ricers are essential kitchen tools for anyone who loves vegetables and wants to create perfectly fluffy, creamy textures for various dishes (think: mashed potatoes or cauliflower). They’re easy to use, affordable, and compact as well, so they’ll fit into any kitchen. Bellemain’s potato ricer in particular really stands out in the field of products due to its handy features and accessories that come with the purchase. Check out specifics of the Bellemain potato ricer below, and see if you could see yourself using it. If you want a nice combination of affordability and performance, Bellemain’s potato ricer is the way to go. It comes at a low price point, but with all the features you’d want out of a quality potato ricer, which are outlined below. The Bellemain Potato Ricer really stands out for its versatility. It comes with three different interchangeable ricing discs, giving you complete control over the outcome of the texture and shape of your grained vegetables. Choose from a super fine sieve disc, a coarser, thicker disc, or a unique long-grain shaped disc. These three allow you to make any number of dishes at any desired texture and consistency you’d like. Many potato ricers just come with one sieve disc, already attached to the basket. Another advantage of this product is its ergonomically designed handles. While some other products have picked up on the importance of a comfort handle on potato ricers, Bellemain took this one step further by integrating optimized ridges into the cushioning to give you the best, most secure, and most comfortable grip possible. This feature is incredibly important because potato ricers are operated manually and rely on your ability to use leverage to push the vegetables through the ricer. It’s also a great device because of its strong, durable, sturdy build. This is thanks to its 18/10 stainless steel building material. Stainless steel is a well-known and heavily relied upon material in the kitchen appliance world because it’s fairly lightweight, but incredibly durable. 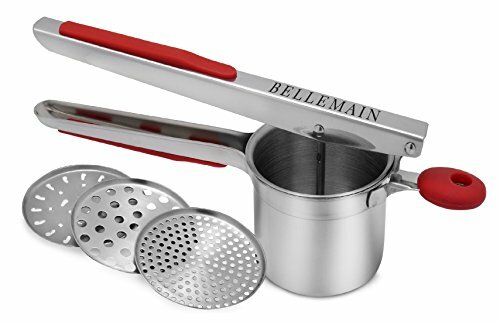 You’ll get years of use with consistent performance out of any stainless steel appliance, including this Bellemain potato ricer. Last, but not least, this potato ricer also comes with a handy no-slip knob that helps you balance the device over your catch bowl. Instead of trying to hold it yourself, you can simply place it on each end of the bowl and go! The extra knob keeps it in place, and it’s coated with a rubber silicone material to hold it in place. To give you a better sense of this product and what you’ll be getting with your purchase, here are some specifics about the Bellemain Potato Ricer. It’s 12.7 by 5 by 4.3 inches, which is slightly larger than the typical potato ricer. It also weighs about 1.6 pounds, which is also heavier than normal, but still manageable. All of those larger measurements are due to longer handles and a bigger basket than most other potato ricers, which may be an advantage if you’re planning to use this ricer often make fairly large dishes with it. The basket capacity comes in at a little over a cup. It’s also entirely dishwasher safe for easy cleanup, and comes with a money back guarantee if you aren’t completely satisfied. With over 1,000 reviews online, and still and overall 4.5 star rating, it is obvious that users are very pleased with this product. People particularly love the handles, saying they’re incredibly comfortable and help them operate the device easier than any other potato ricer they’ve tried. Some say it’s particularly suited for elderly cooks, because the handles enhance performance for people with weaker hands or wrists, especially those with arthritis. Users are also huge fans of the versatility they get from the various disc sizes that allow them to make all kinds of dishes. There are some complaints about tougher vegetables not making it through the sieve. In this case, it’s important to boil the vegetables until they’re tender in order to get them through the ricer. This is the case for any potato ricer, not just the Bellemain. Also, it seems like there was an error in manufacturing for a certain batch of these, as there are a good number of 1 star reviews, all with the same complaint of the device’s metal falling apart after just one use. Most of these reviews happened within a 4 month period last year, which makes me think there was some sort of error with that particular batch. All other reviews, spanning years, are 4 and 5 star, so you can be assured that that strange issue has been since fixed. The Bellemain Potato Ricer is one of the best on the market in terms of all the features and accessories you get for the price. If you’re looking for an easy to use device at a great value, this is the best pick, in my opinion. Never used a potato ricer before? Learn how by clicking here! Have you used this potato ricer? What was your experience? Share with us below!